Bang & Olufsen has unveiled the latest tech in its BeoSound range, the BeoSound 5 Encore - a home music hub that can organise your sprawling music collection. The new music hub is a plug and play system that allows you to instantly access your digital music collection, playing music from a hard drive, computer, wireless device and network server all from the same hub. You can have up to eight of the BeoSound Encores connected to a single server, so you can ensure that each room in your home has access to your whole music collection. 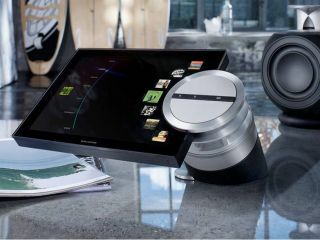 Simply connect a pair of speakers to the music hub and you are able to control your music and playlists on the 10.4-inch display, ending disputes over who is handling DJ duties. The Bang & Olufsen hub allows you to access internet radio stations as well as being able to automatically generate playlists using B&O's MOTS system that chooses similar music from your collection using just one anchor track. The BeoSound Encore 5 is available now, with a UK price of £2,900 - one for each room of the house? You'll need a small lottery win.